We are here to help with all your questions and training goals. The Kinetic Edge team is dedicated to providing you with the highest quality customer support for all your technical and training questions. Browse our manuals for the optimal user settings and threshold power measurements, check out the FAQ page for troubleshooting, read our blog for the latest power training tips, and do not hesitate to contact us with any questions. You can access PowerEdge User’s Manual for Android here and for iPhone here. I have two bikes. Can I use PowerEdge on both? Yes! PowerEdge allows you to create different profiles for each road, tri, or time trial bike you ride. Because there are no hardware components to mount, you can easily use it on any bike. My spouse and I are both cyclists. Can we share PowerEdge on one phone? Yes! PowerEdge allows you to create profiles for different users. Simply choose the profile for the current cyclist and enjoy the benefits of power training. Please note that only one cyclist can use PowerEdge at any given time. How can I determine my threshold power? You can measure your threshold power simply by using PowerEdge. A standard testing protocol to measure threshold power is discussed in detail in this post. You can also read about threshold power in the last section of the user’s manual (see above). Where can I obtain power training programs? We provide free power training plans for beginner, intermediate, and advanced cyclists right here. You can first use PowerEdge to measure your threshold power, which will determine your power zones. You will then be able to perform workouts at different power zones to improve aerobic capacity, to lose weight, to increase your lactate threshold and anaerobic power, or to get ready for a race. In addition, there are numerous online training programs and books on the subject of training with power based on your goals. Cycling and triathlon coaches can also provide you with power training plans and tips. Are there preset power training plans available? Yes! Check out our training page to find 8-week programs for beginner, intermediate, and advanced cyclists. Take our power challenge and see how you can improve your power threshold by 10% in 8 weeks! I logged a ride with the wrong user profile. Can I change it after the fact? 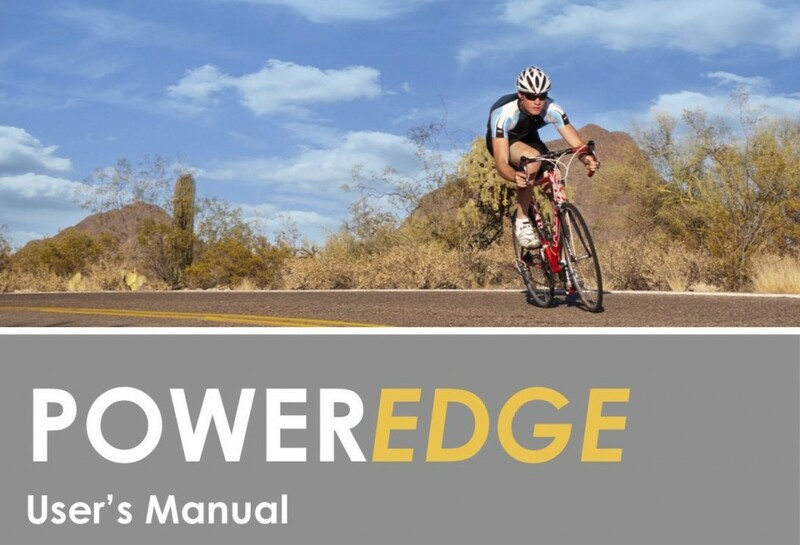 PowerEdge analyzes in real-time the entire ride profile to calculate the most accurate power output of the cyclist. Changing the user profile would affect many aspects of this calculation and is, therefore, not offered. How do I start or stop my subscription? You can download PowerEdge for free from the App Store or Google Play and start a 30 day free trial period. After this period is over, you will start a regular subscription. You can manage your subscription at any time from the app or by connecting to your account on iTunes or Google Play. Can I still use PowerEdge without a subscription? PowerEdge will still work as a free cycling computer without a subscription. However, the power feature, which requires access to real-time data and a proprietary algorithm, requires a monthly subscription to work. Is power training only for very advanced cyclists? Not at all. Power training is a simple and effective way to ride at different effort levels, which is extremely beneficial for cyclists at all levels. Even a beginner cyclist can easily learn to distinguish an easy ride from a harder effort by looking at power levels and gain tremendous benefits. I want to try power training. How do I get started? You can download it easily onto your phone from the App Store for iPhone or from Google Play for your Android phone. How can I see a map of my ride? PowerEdge doesn’t display a map on the main screen during your ride to preserve the battery life on your phone for long rides and to minimize distractions. When you complete your ride, the ride summary offers the option of seeing your entire ride on the map, as well as your stats and a graph of your power zones throughout your ride. Why did PowerEdge shut down during my ride? PowerEdge has a safety feature that shuts the app down when the battery remaining on your phone is less than 10%. This leaves enough charge on your phone in case of a roadside emergency. All the ride data until that point are recorded and can be reviewed and analyzed just like any other ride. One other cause of shutdown that you may very rarely encounter is related to having too many apps running at the same time on your phone. PowerEdge achieves its accuracy by making use of many capabilities of your phone, including the GPS receiver, data communication, and sensors. You may want to shut down other apps prior to your ride to avoid any conflicts. I expected on my last ride. What could be the problem? PowerEdge only records data for a ride if it has accurate GPS position and other necessary data. It will eliminate segments during which an accurate power calculation was not possible. Kinetic Edge has a team of scientists, engineers, programmers, coaches, and exercise physiologists to help with your questions. Browse the options or simply use the form below.